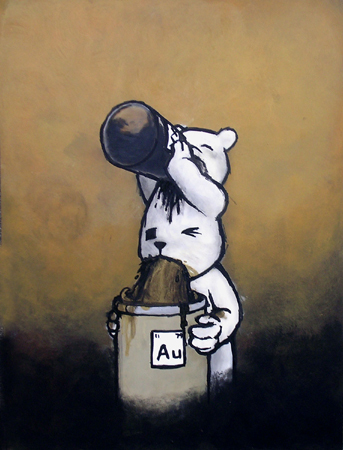 luke chueh has been selling remarkably similar paintings at steadily increasing prices for ages. i totally don't see the appeal but hey, well done for him, he's got something going. I don't think much of the giant robot one, but the rest I really like. First thing I though of when i saw it. I like most of his stuff, I can see the appeal. I really don't like this one though. "Why should I believe you? You're Hitler!" Simultaneously cutesy + grotesque stuff is very in right now, look at the following of Mark Ryden. I very much doubt the majority of his fans could tell you the fine-art blabber that accompanies his art (cause they've never read anything more than a blurb, they just like the cute kiddies and cRaZyness) I think maybe the same applies here.